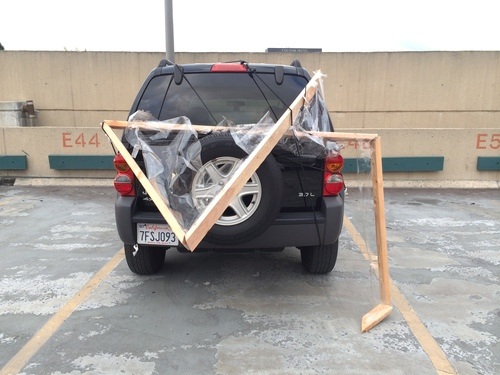 Manchester, Sepulveda, Jefferson, Lincoln, La Tijera (2014) Car, wood, tape, bungee cords 9 ft x 6.5 ft x 4 ft I used clear packaging tape instead of painters tape. I wrapped one side of a wooden frame with the tape to leave the sticky side of it exposed. In this way I was hoping for the tape to act as a spider web, trapping debris, dust, whatever the tape and I came in contact with. 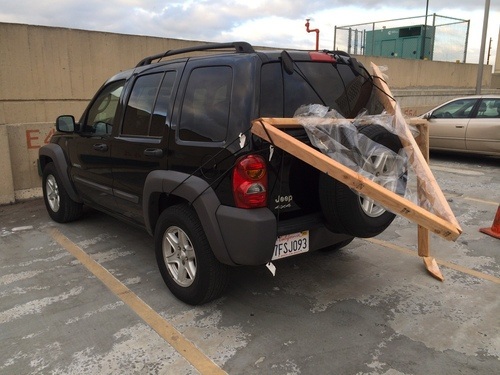 I strapped the wooden frame to the top of my car and started driving. I didn’t go out of my way for the tape, it just came along for the ride. The potential downfall of this approach was that the tape would capture nothing of interest and therefore the viewers would not care about looking at this rectangle shape. After a day or so of driving around the likelihood of anything more than minimal debris being captured didn’t seem like an option. Then a miracle happened. 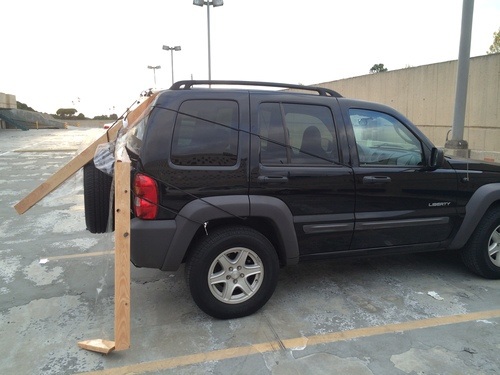 My frame fell apart as I was driving and dangled behind my car with the bungee cords barely keeping it there. This moment recorded my actions far better than dust and debris on tape could do for me. I drove my car to the top of the parking garage and left it there. The garage and my car have become a part of my piece. It has essentially became a public art piece for a couple of days since I left my car there and got rides from friends.